Fantastic review of The Lovecraft Squad: Dreaming (Stephen Jones, ed.) by the Sci-Fi and Fantasy Reviewer. 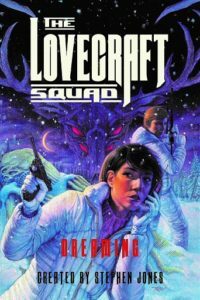 The Lovecraft Squad: Dreaming is a hugely enjoyable anthology, and Stephen Jones has once again worked his magic as editor to pull together some of the best and most imaginative writers in the horror and cosmic horror genres to deliver original, engaging and chilling tales based around the Human Protection League shared universe. Although some of the stories work better than others, they all fully engage with the material on offer, and deliver some surprising angles, most notably Kim Newman’s epic novella. The anthology works because the writers poke their heads behind the curtains of intra-government infighting and political conspiracies, which occurred in real-life, and then integrate those fascinating subjects with the heady, cosmic horrors of the Lovecraftian universe; the conflict between an agency trying to fend off eldritch horrors while simultaneously trying to justify its existence is begging for more meat to be put on the bone, and I’d love to see more in this direction in the future of the series. This entry was posted in News and tagged angela slatter, brian hodge, kim newman, Lisa Morton, lynda e rucker, michael marshall smith, reggie oliver, review, Sean Hogan, Stephen Baxter, stephen jones, The Lovecraft Squad: Dreaming. Bookmark the permalink.